SUPERIOR, Wis. – The Blatnik Bridge is open again after protesters blocked off traffic with a giant wooden teepee early Thursday morning. Superior police say the structure was put up in the middle of the Hammond Avenue entrance to the Blatnik. The people who set it up fled the scene when police arrived around 7 a.m.
Police say a Gold Cross ambulance was delayed in transporting a patient because of the structure blocking the road. 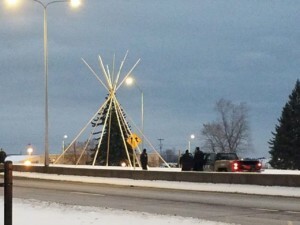 It took the fire department about 15 to 20 minutes to remove the teepee from the road.